Our Putting People First culture is a crucial component of the success of our business. So when we outgrew our space in Cottonwood Heights, Utah, and started looking for a new one, we knew we needed to create a place that not only complimented our culture, but also enhanced it. Workplace environment directly impacts the quality of an employee’s work and level of productivity. By creating a positive environment, a company will not only have happy, engaged employees, but employees who are motivated to grow their careers and contribute to the success of your culture, resulting in a higher retention rate and overall business success. 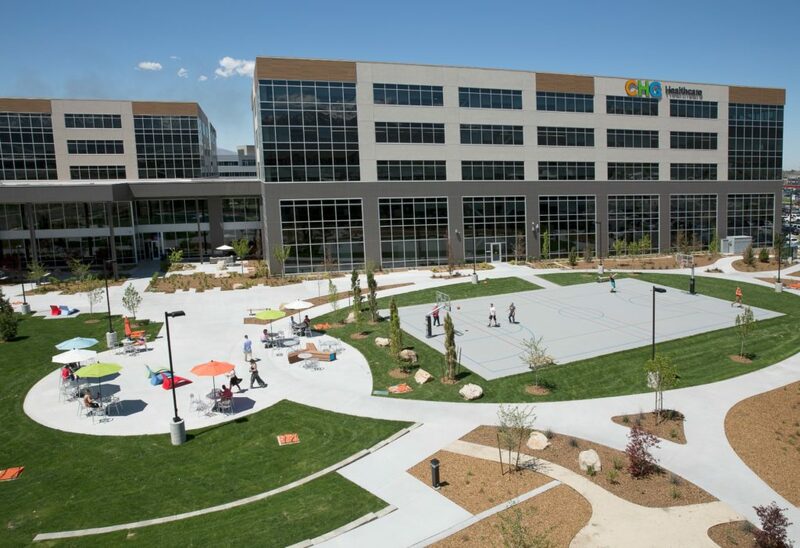 With this in mind we set out to build a headquarters that was just as unique as our culture and would help enrich our employees’ lives. The most important thing a company can do when designing a new space is ask their people for input. At CHG, our employees’ opinions matter, and it’s important to us that our people have a voice in company decisions that affect their experiences with us. Whether it was the type of food the cafeteria should offer to cubicle and commuting preferences, we made sure to seek our employees’ input. This not only helped to ensure that we were including amenities that were meaningful to our people, but gave them a sense of ownership of the new space as well. In fact, our people were key contributors to deciding the location of our new headquarters. After narrowing available building locations down to three choices that were the most centrally located to our workforce, we surveyed employees asking them to share which option they’d prefer. A committee then reviewed the survey and chose our Midvale location based on that feedback. When building our new headquarters, our goal was to create a space that felt more like a home than an office. A space where employees actually enjoyed coming to work, with amenities that encouraged work/life balance. Our People Hub is the heart of our headquarters and connects our two office buildings. The space is open and has a variety of seating options for employees to eat lunch, have meetings, work, or just hang out with coworkers or family members. Also located in the People Hub is the kitchen, which offers high-quality food to employees, and a coffee and smoothie bar. In addition, the entire outer wall of the area is windows, providing natural light and creating an inviting space for employees to enjoy. Another unique feature is that our executive suite is located on the second floor and the CEO’s office and the executive board room has an entire glass wall that is open to the People Hub. This makes our executives visible to anyone in the company and reminds employees that they can approach our executive team at any time. We understand finding a healthy balance between work and home is important to our people. To help them successfully integrate their work and personal lives, we’ve included unique, and easily accessible, amenities within our building design. One of our most popular onsite amenities is our free health clinic. Employees and their family members can stop by the clinic and receive quality acute care from any of our top-notch healthcare providers. Employees also have access to our free state-of-the-art gym, fitness center, and sports court and can checkout cruiser bikes to ride along the Jordan River Parkway trail located near our building. At CHG, fun is not just okay, it’s encouraged. Instead of being hidden in some back room, our fun room is located next to the People Hub and has a lot of natural light. This makes it more inviting and encourages our people to take a break and use it. Employees can choose from ping pong, pool, arcade games, shuffleboard, air hockey, and foosball — just to name a few. Also, our outdoor space includes a sports court, amphitheater, a variety of seating options, fireplaces and Wi-Fi, giving employees the option to spend time with coworkers or the flexibility to work wherever they’d like. Understanding the importance natural light has on the health and wellness of our employees, we intentionally designed the work areas with cubicles along the windows and offices in the center. In addition, we used a new tiered ceiling technique that minimizes the amount of direct artificial lighting employees are exposed to. And all of our common areas — People Hub, fun room, and gym — are located along the outer edge of the building, with walls made entirely from glass. All of this allows daylight to be the main source of lighting and provides many physical and mental health benefits to employees. One of our favorite features at our new headquarters is the environmental graphics throughout the building that allows us to visually tell our culture story and showcase the important role our core values play within the company. In addition, each floor has its own identity and focuses on one of our core values — Putting People First, Growth, Quality and Professionalism, Integrity and Ethics, and Continuous Improvement. Take a tour of our new headquarters in the video below.